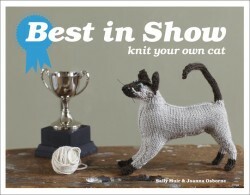 Best in Show: Knit Your Own Cat offers the unique opportunity to knit yourself a cat. There are 25 different breeds included, from a charming moggy to a sleek Siamese, a precious Persian to a loving long hair. With Sally Muir and Joanna Osborne's designs you can now knit your precious pet, reproduce your favourite breed or even knit the cat you have always desperately wanted. The cats are surprisingly easy to make. It will only take a few evenings to create a covetable companion for life. Idiosyncratic descriptions of the various breeds accompany beautiful photography, making this book irresistable for both keen knitters and devoted cat-lovers.